It’s early January, when New Year’s resolutions seem attainable, extra pounds from the holidays losable, and sound policy from new state legislative sessions at least possible. By now, 14 state capitals have welcomed their lawmakers back to town, and before the month is out, another 23 sessions will begin. Over the next few weeks, legislators from Albany to Anchorage will introduce thousands of bills covering all sorts of topics. 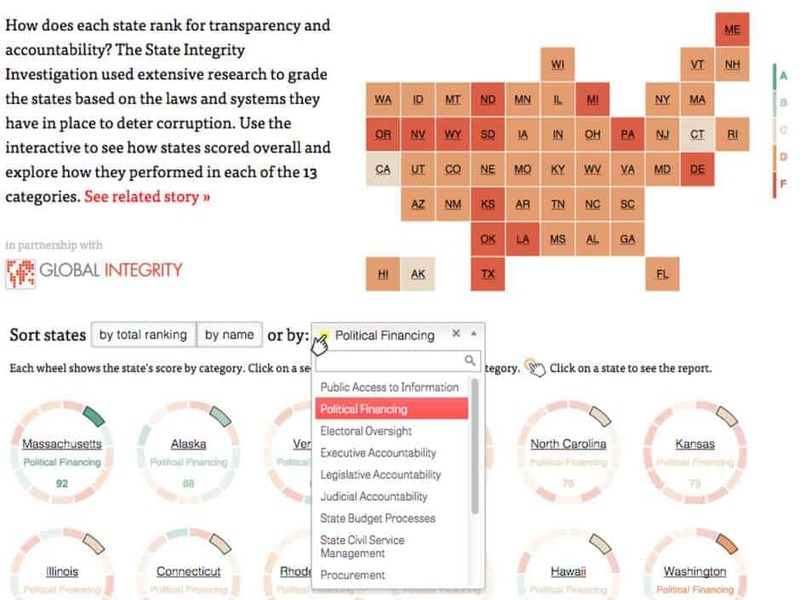 And in a handful of states, including New York, South Carolina and New Mexico, there’s a particular focus on ethics and open government — subjects covered in depth by the State Integrity Investigation, a data-driven evaluation and ranking of state government transparency and accountability published in November by the Center and Global Integrity. On Tuesday, Gov. Jay Nixon of Missouri said ethics reform would be his top priority this year, and called on the legislature to enact limits on campaign contributions, a ban on gifts from lobbyists and a halt to the “revolving door” of lawmakers becoming lobbyists immediately after leaving office. Each of those issues contributed to Missouri’s D- grade from the State Integrity Investigation. The project detailed the scope of the conflicts of interest and back-room dealings that plague state governments nationwide. The investigation has yielded calls for reform in several states, and as Missouri makes clear, the project can also help point officials and advocates toward solutions and “best practices.” The state grades are based on 245 “indicators” of openness and accountability — whether lawmakers must disclose their finances, for example, or whether ethics watchdogs have adequate funding — which are divided into 13 categories. There’s a wealth of data behind each of those indicators. Here’s a guide for how to find it using our interactive app. 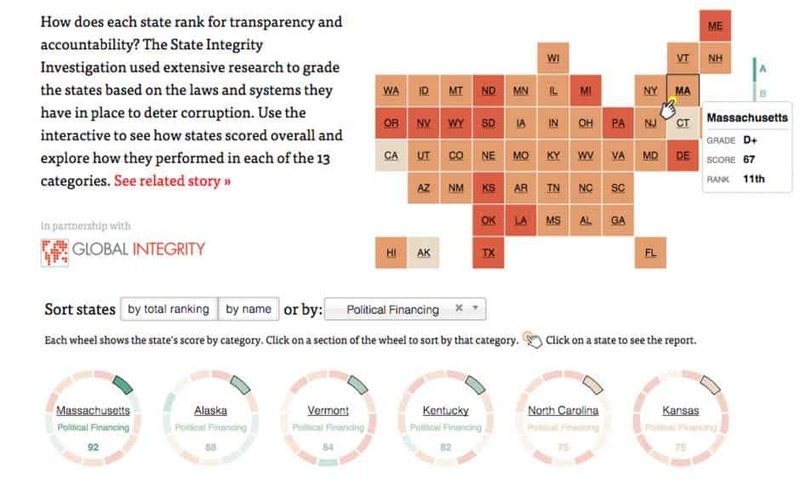 We ranked the states from top (Alaska) to bottom (Michigan) based on the laws and systems in place to promote transparency and prevent corruption. 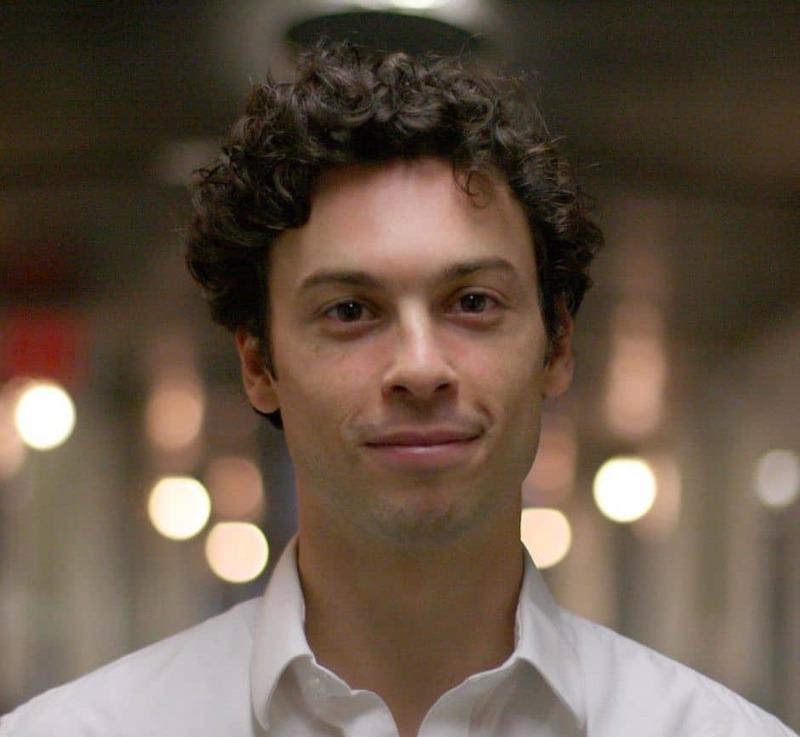 But the interactive app also allows users to rank the states by each of the 13 categories, so a reform-minded lawmaker in Mississippi, for example, which ranked last in the category for political financing, could easily find which states scored the best in that category and understand exactly why. Either method will sort the states by rank, listing Massachusetts — which scored a 92, or an A, in political financing — first, and Mississippi — which managed just a 34, or an F — last. Why did Massachusetts score so high in this category? Just click on the state’s wheel, or on its box in the map above, to find out. Massachusetts’ state page, with the article below and the expandable report card above, shows the grade, score and rank for every category. All 13 are expandable with the click of a mouse, revealing each of the indicators used to generate the category score. And here lies the utility of the State Integrity Investigation for those seeking changes. Before the project’s first go-round in 2012, reporters and editors with the Center and Global Integrity interviewed nearly 100 experts in state government — including public officials, academics and advocates — to compile a list of the key indicators of government transparency and ethics. Last year, we returned to many of those experts and to some new ones to refine and edit the list. The results: 245 questions that ask about the laws on the books (“in law” indicators) and how those laws are implemented and enforced (“in practice” indicators). Experienced journalists in each state conducted extensive research and reporting before scoring the questions based on specific criteria (see our methodology for more on scoring). Reporters were required to provide explanations for the score and also to list all of their sources, including links to state laws. 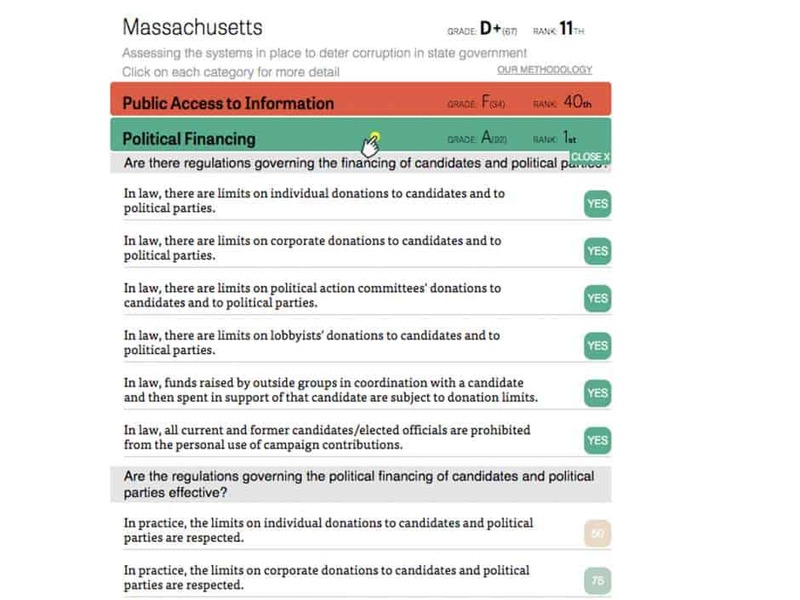 So, by clicking on the political finance category in Massachusetts, for example, a Mississippi lawmaker who wants to improve that state’s campaign finance system could see that the Bay State earned top spot partly because it places limits on donations to candidates and parties from individuals, political action committees and lobbyists, and because those limits are relatively effective. The lawmaker could click on the indicator asking about limits on contributions from PACs, for example, to see an explanation of the law as well as a link to its actual text. 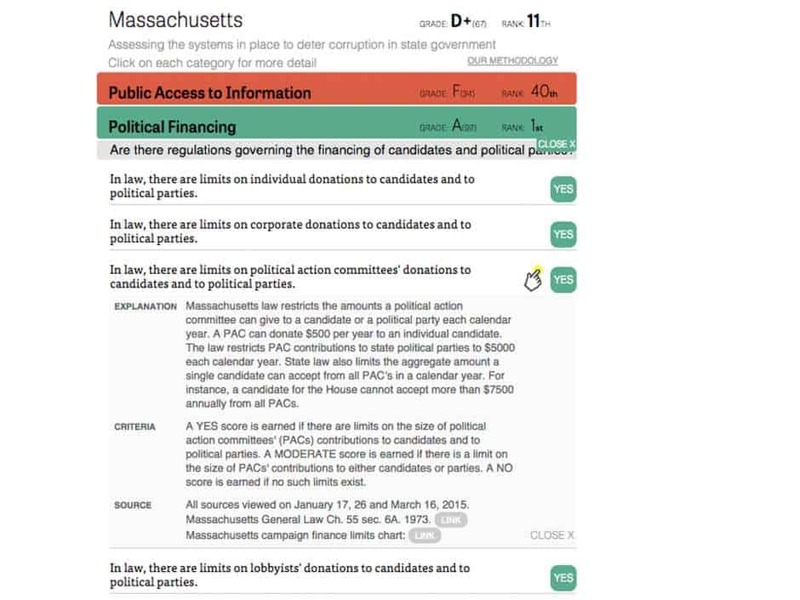 The lawmaker could also scroll to the last question in the category to learn about how Massachusetts makes political finance records available to the public in so-called open data format, which allows people to download and sort the data. Similar stores of information and links lie behind every indicator, in every category, in every state. Readers can also download the full dataset here. As for any other New Year’s resolutions, though, reform-minded lawmakers are on their own.